Microsoft announced the next version of PowerShell Core this week. The next version will be PowerShell 7 and not PowerShell Core 6.3 as many expected. 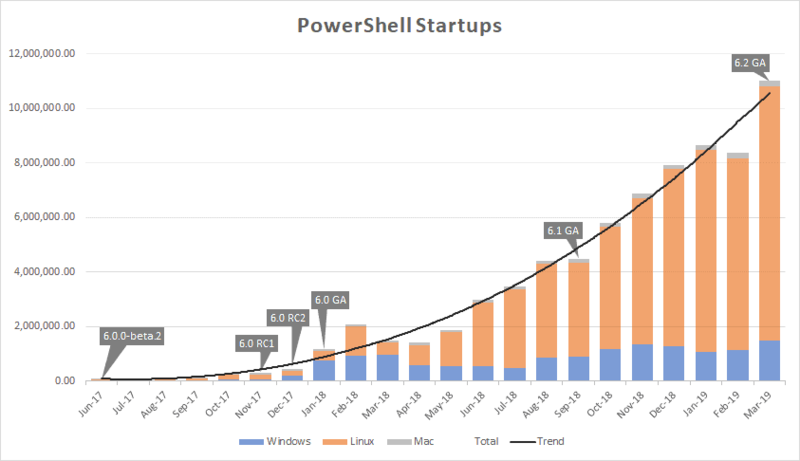 It signals a significant change in the development of PowerShell as Microsoft makes another important step in replacing the trusted PowerShell 5.1 on Windows with PowerShell Core. Microsoft devised a plan to change that, and PowerShell 7 is the key to the plan's success. PowerShell 7 is based on .NET Core 3.0 which means that compatibility with Windows PowerShell modules increases to over 90%. If Commodore had had a decent publicity team, we’d be using Amigas, instead of this IBM-compatible rubbish. Way more powerful than Winderz, at the time. You could live, quite happily, with the GUI, or the CLI/DOS. @ K@: I remember back when i did fight with DOS on computers. It sure was a challenge, but i liked that challange. I never came as far as Amiga, but i had both Commodre VIC-20 and 64. I still own five Commodore 64. I’m old — I’ve been using computers from back when there were no commercial microcomputers at all. When I think back on the range that I’ve used, from the PDP/11 to today’s newest machines, the C64 still remains my favorite. What is the purpose of having Powershell Core? It replicates Powershell isn’t it? It will be interesting to know how many people use Powershell instead of command line and who are not network admins etc. I am speaking of normal users who boot their PC to play a game or watch a movie. I have used Powershell maybe once last year (may be to run one command for disk cleanup) only because I found it fancy. I still trust command line. So how many of you use Powershell? @MartinBrinkman do you? The future is PowerShell Core and Microsoft is working on improving compatibility so that it can replace PowerShell on Windows eventually. Integration as a feature is the next step. I can’t see normal users ever using PowerShell knowingly, and I don’t think for a second that Microsoft is targeting those regular users with PowerShell. As a sysadmin, I use PowerShell a lot for user onboardings/offboardings, managing Exchange/365 mailboxes, and even to tap into web service APIs. Powershell is really slow. CMD starts in less than 1 second and Bash loads in around 1 second, meanwhile Powershell will take 3-5 seconds. So I see no reason to use Powershell. Not often, but occasionally in conjunction with development on Windows at work. At home, I only run Linux — and PowerShell doesn’t offer me anything of value on Linux.